Warning: This article is not for the faint of heart. 1. This job is rough, tough, and most likely too difficult for you. The vast majority of people I talk to who want to become an entrepreneur are 100% certain they can leave their job, create something out of nothing, and be financially self-reliant within a short time. I, however, am 100% certain they cannot. If you think you are an entrepreneur, most likely you are not. In 90 days, most of you will be out of business…and 90 days is a stretch. The odds are absolutely stacked against you. If I were a betting man, I would bet that your first attempt would fail. Quickly. None of this is to say you should not believe in yourself if you want to be an entrepreneur. You should. You must. But believing in yourself without some sort of concept of reality is foolish, and it’s the trap most new entrepreneurs fall into. Most of the time, people are not in a mental state where they can face rejection and start eating “no’s” for breakfast like I describe in 20,000 Days and Counting right away. If you start out eating 30 “no’s” a day unintentionally, you will get sick! And trust me, there will be a plethora of “no’s” in the beginning. 2. It's your idea, so start with your money! The startup industry is booming right now. There’s so much venture capital out there that everyone thinks their idea is worthy of hundreds of thousands in angel investor dollars. Everyone seems to think they have a Google- or Facebook-level idea, but what they don’t think about is the fact that those were not overnight successes. Watch the Facebook movie. They were busting their butts for years! They had already proven their value by the time the cash was rolling in the door. Don’t wait on outside dollars. Finance it yourself. Remember that you are NOT short money; you ARE only short one idea—so find that one idea to make more money now. Today is critical. 3. Play it smart and don't quit you day job, at least not yet. This is the most obvious way to finance your entrepreneurship. What it takes to be an entrepreneur does not take full time immediately. The beauty of entrepreneurship is that you can test it while still having a full time job. When I started managing Andy Andrews over 30 years ago, I backed myself up with three part time jobs. Oh, and if you think you don’t have the time to work a full time job (or several part time jobs) and work on your entrepreneurial dream, then you haven’t read Jon Acuff’s Quitter. Buy it, right now. 4. Never assume anything about anyone and remember.. good people are hard to find. The biggest mistake I’ve made as an entrepreneur is that I once thought other people knew what they were doing. I assumed that if they had the degree or the company that says they knew how to do something…that they actually knew how to do something. The majority of people you are going to need to help you out, whether it’s website creation, copywriting, branding, or anything else, will say they know what they’re doing, but it’s the minority who actually can deliver on that promise. Finding an accountant who can count, a graphic designer who can do graphics, and a web person who can make websites is so much more difficult than it sounds. The harsh reality is that there is no right answer. When you start, trial and error are your two biggest tests. The only semi-reliable quality you can go on is whether the person you are hiring has the “people” quality. Do they leave you with a good impression? Do they know how to communicate? Can they write an email without sounding like a fool? If you can answer “yes” to those questions, that’s a start. 5. You need to go to bed crying and wake up vomiting. If this is going to work, everything in your being has to be so intense that these two functions become regular. You have to be so passionate that it feels like your hair is on fire 24/7. If you walk around casually sipping a cup of coffee every morning, you are not an entrepreneur. A true entrepreneur is running so fast they probably have forgotten to eat breakfast and take a shower. It is impossible to be an entrepreneur and stand around the water cooler with a cup of coffee. It will not happen. Some of this post may have discouraged a few of you. If so—good! The world needs less passionless entrepreneurs. However, if you made it through…and you STILL possess a desire to make whatever your venture is work… then I hate to say it, but you should definitely go for it. Jump right in, but do it with a sense of reality. Keep these seven things in mind, work, work, and then work some more…and you just might make it. Never lose sight, however, of what makes every business successful—people. You are now officially in the people business. Congratulations!!! Robert D. Smith, known affectionately to those around him as THE Robert D, is a leader in providing life-changing entertainment resources, a global customer service rep, and a favorite uncle. For more than three decades, he has managed and overseen the career of Andy Andrews, a three-time New York Times best-selling author and in-demand speaker. 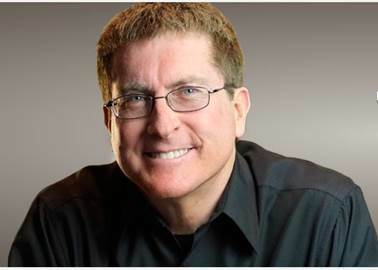 He has served as a private consultant to numerous best-selling authors, speakers, entertainers, and cutting-edge organizations, educating them on the unique methods he has employed to sustain massive success and growth across multiple industries for the past 30+ years. Characterized by his never-say-die attitude, Robert has made a habit of powering through adversity and closed doors at every turn. He was rejected 51 times while pitching Andrews' first manuscript, "The Traveler's Gift." While most would have quit, Robert persisted through "no" after "no." "No's don't scare me...I eat no's for breakfast," he says. "All a 'no' means is that you're one step closer to a 'yes.'" The Traveler's Gift, of course, went on to become a New York Times bestseller and a featured selection of ABC's Good Morning America. It is now available around the world in over 25 languages, another volume in a catalog that continues to sell at an impressive rate. "They tell us that a book by Andy Andrews sells every 60 seconds somewhere on the planet," he says with a grin. His unique lifestyle, magnetic personality, and uncanny ability to get the best out of those with whom he works shine through in his debut book "20,000 Days and Counting," which he describes as a crash course for anyone wishing to get the most out of each and every day, hour, and minute they spend on Earth. 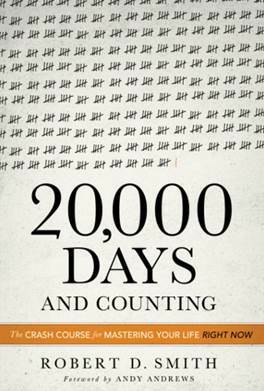 "20,000 Days and Counting" shows you how to maximize every moment and live purposely with tremendous certainty of who you are and what you are here to do. Robert spends his spare time mentoring the next generation of entrepreneurs and creative thinkers, teaching them lessons in business, finances, and living lives of meaning. He enjoys creating lasting memories with those around him by seizing opportunities for magic moments in seemingly ordinary settings. If you find yourself out to dinner with him, he will insist that everyone order dessert first. He currently resides in the countryside of Franklin, TN, just south of Nashville.